After an extended holiday hiatus, The Mouse Castle Lounge podcast is back with a new weekly format for the new year. In this week's show, I discuss how Disney fared with the Oscar nominations announced last Thursday and also take a look at Tim Burton's stop-motion upgrade of Frankenweenie, just released on home video and my choice for Best Animated Feature at the Oscars. I'll also preview Disneyland's new tribute to the Golden Horseshoe Revue, part of the park's 2013 "Limited Time Magic" promotion. The show pays homage to the original Revue, which starred Wally Boag, Betty Taylor and Fulton Burley and ran for decades at Frontierland's Golden Horseshoe Saloon. In a new Mouse Castle Lounge segment, I introduce "The Wonderful World of Bloggers," spotlighting who (besides me, of course ;-) ) is presenting the best Disney blogs and podcasts on the 'Net. This week, it's Disney Legend Floyd Norman, whose Mr Fun blog is a clever collection of anecdotes and observations from the cartoonist, animator and story man whose career spans from Disney's post-World War II animation comeback to the modern era of CG animation at Pixar. Another new segment I've added to the mix is "The Disney News Archive," revisiting forty years of Disney News and Disney Magazine publications from 1965 to 2005. In the first installment, our random time machine is set to Spring 1996, which saw Disneyland bidding farewell to The Main Street Electrical Parade, film critics Gene Siskel and Roger Ebert marking 20 years of working together on television, and ragtime pianist extraordinaire Rod Miller reminiscing on over 25 years of tickling the ivories at Disneyland's Coke Corner. Miller would stay with Disney another 11 years and, in 2010, I caught up with him at an anniversary event at the Walt Disney Family Museum in San Francisco. All this and more is in this week's episode of The Mouse Castle Lounge. I hope you enjoy it. The Blue Umbrella is directed by Saschka Unseld and produced by Marc Greenberg. It will open in U.S. theaters with Monsters University on June 21. At first glance, it's very reminiscent of another inanimate-objects-in-love story from Disney's Make Mine Music (1946), "Johnny Fedora and Alice Bluebonnet." Make Mine Music was the first of three compilation films that Disney produced in the late 1940s, the others being Fun and Fancy Free and Melody Time. Each film was made up of multiple short cartoons set mostly to popular music (although some did incorporate classical and jazz numbers). "Johnny Fedora and Alice Bluebonnet" was sung by the Andrews Sisters, one of the most popular singing groups at the time. One of the many joys of collecting Disney memorabilia is finding an item that connects you to a moment in time. It may not be a significant event in the grand scheme of things, like the premiere of Fantasia or the grand opening of Disneyland, but sometimes just a small piece of history gives you that sense of "being there," especially when a little research unveils some interesting stories. 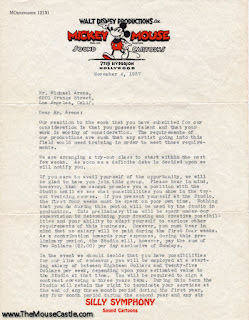 I recently acquired a two-page letter typed on Walt Disney Productions stationary. It caught my eye mostly because it was from Walt's Hyperion studio in Hollywood, the birthplace of Oswald, Mickey Mouse and the Silly Symphonies. 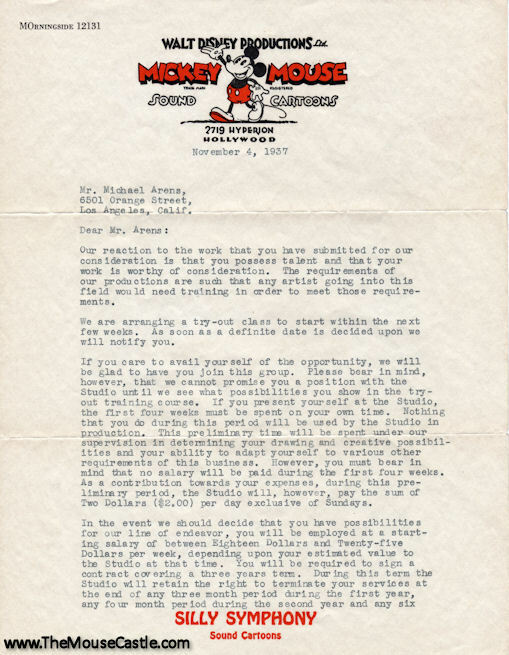 At the time the letter was written, the studio was frantically finishing up production on Snow White and the Seven Dwarfs with its premiere at the Carthay Circle Theater in Hollywood less than two months away. Our reaction to the work that you have submitted for our consideration is that you possess talent and that your work is worthy of consideration. The requirements of our productions are such that any artist going into this field would need training in order to meet those requirements. We are arranging a try-out class to start within the next few weeks. As soon as a definite date is decided upon we will notify you. If you care to avail yourself of the opportunity, we will be glad to have you join this group. Please bear in mind, however, that we cannot promise you a position with the Studio until we see what possibilities you show in the try-out training course. If you present yourself at the Studio, the first four weeks must be spent on your own time. Nothing that you do during this period will be used by the Studio in production. This preliminary time will be spent under our supervision in determining your drawing and creative possibilities and your ability to adapt yourself to various other requirements of this business. However, you must bear in mind that no salary will be paid during the first four weeks. As a contribution towards your expenses, during this preliminary period, the Studio will, however, pay the sum of Two Dollars ($2.00) per day exclusive of Sundays. In the event we should decide that you have possibilities for our line of endeavor, you will be employed at a starting salary of between Eighteen Dollars and Twenty-five Dollars per week, depending upon your estimated value to the Studio at that time. You will be required to sign a contract covering a three year term. During this term the Studio will retain the right to terminate your services a the end of any three month period during the first year, any four month period during the second year and any six month period in the third year. 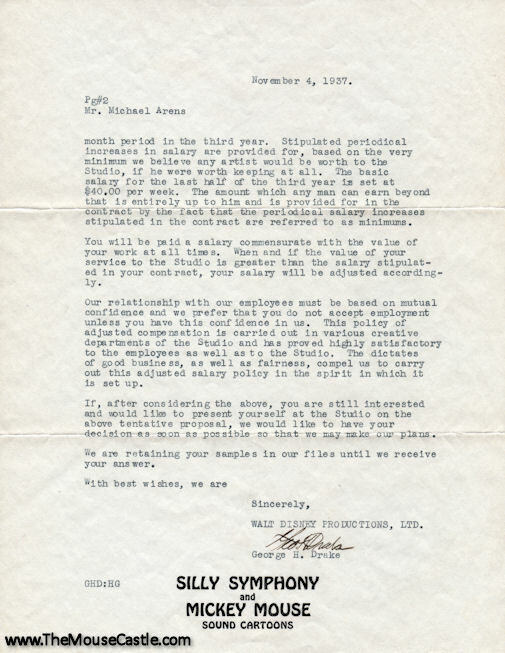 Stipulated periodical increases in salary are provide for, based on the very minimum we believe any artist would be worth to the Studio, if he were worth keeping at all. The basic salary for the last half of the third year is set at $40.00 per week. The amount which any man can earn beyond that is entirely up to him and is provided for in the contract by the fact that the periodical salary increases stipulated in the contract are referred to as minimums. You will be paid a salary commensurate with the value of your work at all times. When and if the value of your service to the Studio is greater than the salary stipulated in your contract, your salary will be adjusted accordingly. Our relationship with our employees must be based on mutual confidence and we prefer that you do not accept employment unless you have this confidence in us. This policy of adjusted compensation is carried out in various creative departments of the Studio and has proved highly satisfactory to the employees as well as to the Studio. The dictates of good business, as well as fairness, compel us to carry out this adjusted salary policy in the spirit in which it is set up. If, after considering the above, you are still interested and would like to present yourself at the Studio on the above tentative proposal, we would like to have your decision as soon as possible so that we may make our plans. We are retaining your samples in our files until we receive your answer. In the mid-1930s, the Walt Disney Studios was growing by leaps and bounds, buoyed by the phenomenal success of Mickey Mouse with an eye towards a future in feature animation. 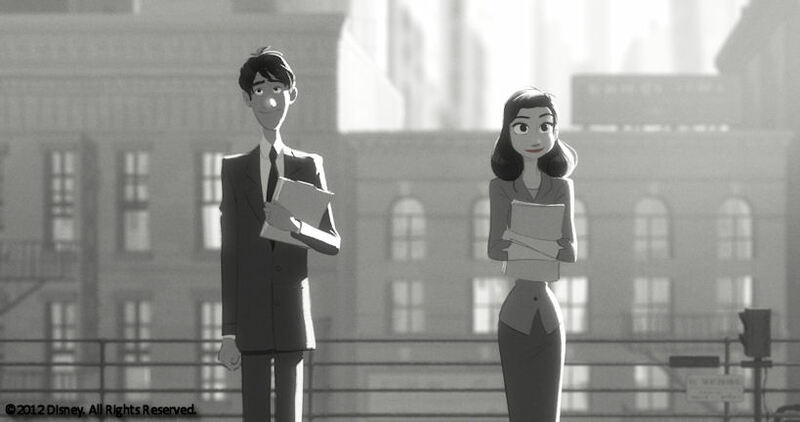 Many animators were hired on a trial basis (and given a modest stipend) to see if they had what it took to make it in the business. A lot of prospects couldn't cut it and were quickly let go. Mike Arens, however, had the talent. He began working at the studio on December 6, 1937, breaking in as an in-betweener and eventually contributing to Disney's Pinocchio as well as the "Dance of the Hours" segment in Fantasia. It was likely a difficult path for him early on. By all accounts, Drake was a difficult man to work for and had limited talent as an animator. In his biography of Walt Disney , Neal Gabler described Drake as "a screaming hatchet-faced martinet" and "the most hated man at Disney." Michael Barrier, in his Walt bio , said, "Drake himself was disliked by most of his charges." Barrier quoted animator (and Disney Legend) Eric Larson, who observed Drake "couldn't draw worth a damn." Arens, for his part, eventually left Disney to serve in the military during World War II. 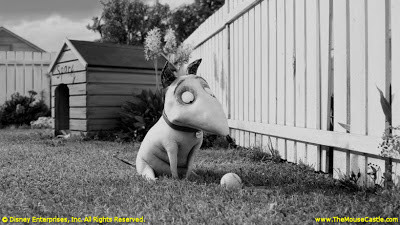 Upon his return to civilian life, he established himself as a comic strip artist, drawing the newspaper strip Hey, Mac! from 1947 to 1961. Other comic strips soon followed, mostly Western-themed titles like Gene Autry, The Frontiersman, Buck Jones, Rex Allen and Disney's Davy Crockett, King of the Wild Frontier. In the 1960s, Arens drew other Disney comic books and strips including Chip 'n Dale, Goofy, Donald Duck, and Mary Poppins. In animation, Arens spent a number of years in the 1960s and '70s as a layout artist at Hanna-Barbera where he worked on various TV series including Scooby Doo, Where Are You!, Fantastic Four and The Pebbles and Bamm-Bamm Show. He also did layout for Hanna-Barbera's great 1973 animated film Charlotte's Web. Arens died in 1976. Walt's studio on Hyperion Avenue has long since gone away. Following the success of Snow White and the Seven Dwarfs, a bigger, more modern studio was needed to accommodate the company's growth. In 1940, Walt and his staff made the move to Burbank, where the Walt Disney Studios remain today. What was left of the old Hyperion buildings was torn down in 1966. Today, a Gelson's Market stands on the spot where Mickey Mouse was born. I love being able to hold a sheet of paper in my hand that ties all this history together. 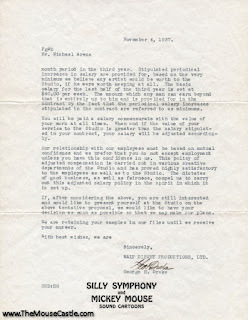 Arens' job acceptance letter marked the beginning of his very active and successful career in cartooning and animation. And, at same time, it placed him in the heart of a legendary studio. A moment in time captured forever. As we begin 2013, I hope this year brings you a wonderful world of experiences and new beginnings. Happy New Year! He was working in the animation department from 1937 until he resigned in 1942. He returned to work in the comic strip department from 1969 until his death from a motorcycle accident on June 19, 1976. In the meantime, he had worked at Hanna-Barbera, Playhouse Pictures, and Western Publishing Co. For the comic strip department, he primarily worked on the Treasury of Classic Tales (series of strips tied in to current Disney film releases).